Join us for the largest Warhammer game of the year, August 25th at Battleground in Abington. To REGISTER please visit this link or search our online store for “Megabattle”. Please don’t forget to include the team you’d like to play for (Order of Disorder) and the tshirt size you’d like during checkout. Please check off the “Add a note for the Vendor” box and leave us a message. This will be Battleground Games & Hobbies seventh Warhammer 40K Megabattle. It will be hosted at the Abington location on Saturday, August 25th, 2018. Our Warhammer 40K Megabattles have always been major events at Battleground. We put a lot of effort into creating an event that focuses on the “fun” and “fluffy” part of 40K. Typically, the tables look gorgeous and the landscape of completely painted armies strewn about make for quite an impressive looking game. This year, we are making a more concerted effort to “theme” the event. Participants are encouraged to not only bring their armies, but to spend a little thought as to why your army is there. As usual, we are splitting the two table sides into Order and Disorder. We recognize that the armies that fall into one side or another are debatable, but for the past six Megabattles these delineations have worked pretty well. It is possible that you see the same codex fighting for both sides. 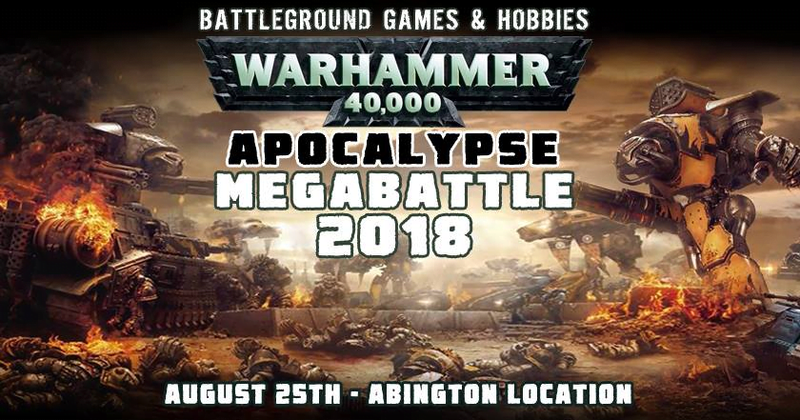 We encourage everyone who loves to play the game, and can muster a fully painted army, to join us on August 25th to experience the maximum carnage of Warhammer 40K.The setting for the battle will be the planet of Gorgos Delta…..
Before the coming of the Cicatrix Maledictum, the planet of Gorgos Delta was of little consequence to anyone. Searing winds and geological instability made life difficult for those who lived there. Still, vast sources of promethium made the world a small but important cog in the war machine of the Imperium. Two great cities oversaw the mining and production of the vital resource: Aamuel, which consisted mainly of survey personnel and refineries, and Hethradiah, home to miners and drilling machinery. Both cities worked in concert to keep the promethium flowing in the Emperor’s name… until the Great Rift appeared. Baleful Warp energies deluged the planet, which now rested just on the edge of the ragged tear in the fabric of realspace. With these energies came the rise of a new power on Gorgos Delta. It began with accidents: drillers suffering horrific burns that should not have been possible with properly maintained equipment. Then survey teams began to have visions of an enormous slumbering force. When the rocky ground between the two cities cracked open to reveal surges of living flame, the truth was revealed: the promethium was now alive, and possessed of a will of its own. Within weeks, nearly all those who dwelt on the planet had begun to worship the entity, hailing it as the Ever-Burning, a new god born of fire. Such worship does not go unnoticed. Across the Warp, the faithful of Chaos received omens and commands via daemonic messengers. After all, the Ruinous Powers are jealous gods. The dictum came forth to destroy this upstart entity, lest it draw too much of the Warp’s power into itself. The populace of Gorgos Delta would fall under the sway of Chaos, or they would bleed. It was not long before the Imperium of Man, too, became aware of the heresy on Gorgos Delta. The response was no less swift: regiments of the Astra Militarum were duly dispatched to annihilate those who had turned from the Emperor’s light. Such blasphemy also did not escape the attention of the Adeptus Astartes, and soon great battle-barges surged toward the planet. The Aeldari were all too familiar with the creation of gods. Farseers kept a watchful eye as the planet descended into madness, while the Drukhari wondered if perhaps this new entity might assuage the endless withering of their souls. For the Ynnari, the strange new force on Gorgos Delta offered a potentially powerful weapon against Slaanesh, and so they too were drawn to the flame. No one can say how word reached the Arch-Arsonist of Charadon of the living flame’s existence. Perhaps it was a tortured captive who first spoke to the Orks of Gorgos Delta and the Ever-Burning, or maybe some strange vision came to the mad pyromaniac via the Orkish psychic field. In any case, almost immediately a great WAAAGH! had formed to go lay claim to the planet for the Orks’ destructive ends. Massive space hulks burned red even in the vacuum of space, driven onward by the Arch-Arsonist’s compulsion to seek “da biggest burnin’ dere is”. For Gorgos Delta, for the denizens of the Aamuel and Hethradiah, and for the burning fury growing in the planet’s core, the future would bring only war. To register please visit this link. 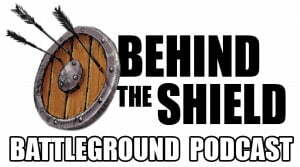 This weekend there’s a massive L5R event going on at our Saugus store so Andrew and Amanda interview local Legend of the Five Rings LCG fan Brandon to find out what’s up with this game and with the Katanastravaganza event. For the first time since 2015 we have a new Core set for Magic the Gathering. Andrew and Amanda review what to expect from the set ans what it means that it’s a Core set. Amanda got to play in a FATE Core System RPG last Sunday and has a lot to say about how much fun the system is and how it differs from the familiar territory of D&D. Sam’s third RPG of the Month is going on in Norton this weekend. We get a chance to talk to him about what RPG of the Month is all about and about our plans to stream the session on Twitch for the first time this month.